Allens Pineapples could not get any more Australian and I think you either love them or hate them. WELL I LOVE THEM. Bright and tangy they are a pineapple flavour jubes to brighten your day. Great for the Australian themed beach party, tropical and fun. I’ve even seen people coat them in chocolate. That is genius! Add some fun to your next party. 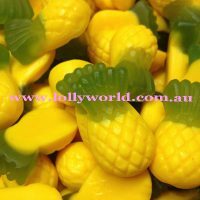 Allens Pineapples could not get any more Australian and I think you either love them or hate them. WELL I LOVE THEM. Bright and tangy they are a pineapple flavour jubes to brighten your day. Great for the Australian themed beach party, tropical and fun. I’ve even seen people coat them in chocolate. Add some fun to your next party.